Drinking Chocolate paired with George Paul Chocolates Habanero Caramel. I had a chance to stop in at George Paul Chocolates to deliver a poster for the NW Chocolate Festival. A sipping chocolate seemed just the perfect beverage for the day and then Marcos convinced me to try their Habanero Caramel. I was amazed, it wasn't too spicy, just enough to make the caramel interesting but not enough to set my mouth on fire. The play back and forth between the sweet caramel with a touch of heat and the dark, slightly bitter drinking chocolate was fun. 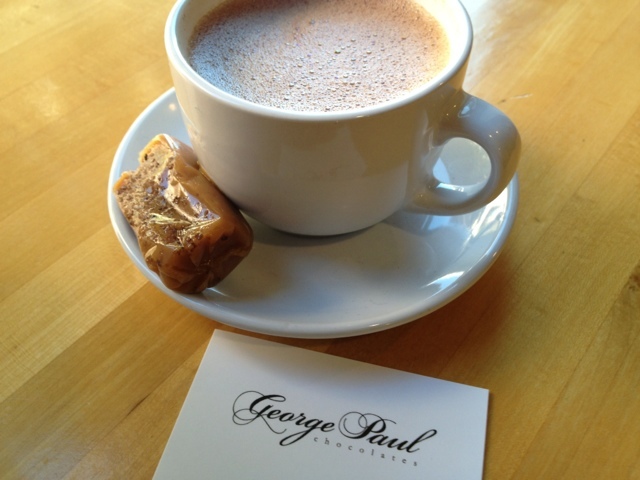 George Paul Chocolates will be at the NW Chocolate Festival, look for their booth when you get there! If you are going to the festival please let me know! I'd love to meet more chocolate loving people so that we can talk serious chocolate!